increase will come in effect on Tuesday 7 October, i.e. next week. of this weekend, so I can order parts at their current price. Shapeways could even get near to their prices should have been a clue. Circle Square Triangle is an interesting puzzle app game good for students of geometry & draftsmen. At the top of the screen is the 3 dimensional object. It rotates slowly. Your task is to identify which of the 25 choices matches it exactly. When you swipe the screen to the right, all 25 images will shift. There is a time element. How many can you solve in 60 seconds? Takafumi Yamamoto has created an interesting puzzle app game called Mergect. I'm assuming the word is a combination of merge and intersect. Look at the first image. The blue and red squares are dancing around the grid. You must tap some of the white squares to make them black so that hopefully the red & blue squares will merge/intersect in the purple square at the same time. See the white squares with X's? Those squares cannot be turned black because they are next to a red or blue square. When they pass along further along, the X will disappear. Look at the second image. You'll notice that the red & yellow squares cannot get to the orange square. You will have to turn the black squares back into white squares. Look at the third image. See the white squares with 4 dots? They can never be turned black. The fourth image shows 2 objectives. The fifth image shows a square with a diagonal. The two colored squares must not merge into that cell. Bottom Line: I was expecting to dislike Mergect. But I kept playing it. There are 50 levels and I've solved the first 48. I've given up on the last two. Way too hard. In fact, I'm even surprised that I solved some of the other levels! A friend recently told me about Buttons & Scissors - another fine puzzle app game. The object is to swipe groups of buttons - of the same color - and cut them off until there are no more buttons on the screen. This concept is not exactly new. But strangely, I can't name another puzzle app that's exactly the same. BoxOff is similar and definitely more sophisticated. The 5x5 levels of Buttons & Scissors were helpful for me to start on because I figured out what not to do. The 6x6's are not much harder. The 7x7's are pretty tough. Fortunately, there's a good undo button that allows you to undo as many times as you want. 'More than 1000 levels!' I actually think that's a bad thing. Better to give us anywhere between 50 & 150 levels. I have to admit, I really love the graphics. If you know the solution, you can get or 6 pairs of scissors moving across the board at the same time. But you have to be fast. The object in Cubical it to score points by tapping all the squares of the same color before time runs out. The squares keep changing colors so it's a bit frantic. Definitely good for kids, but all adults should engage in these types of games now and then. At least to ward off Alzheimer's. There isn't much to say since the first 2 images describe everything. Swipe the Arrows is fun enough for maybe 10 minutes. Challenge your buddy. Or play the game to ward off Alzheimer's. There was another game that I played & reviewed that was very similar. Photon Lab comes from Jonathan Kinnersley. It's been sitting on my ipad for a long time now. As you can see from the images, it's a laser puzzle app game that requires you to shoot beams of light - in this case - photons, and get them to their target. We've seen numerous laser puzzles over the years. And I'm sure we'll see many more. What's different about Photon Lab: when you place the mirrors and press FIRE, not only must you reach the targets, you must also make sure that each square gets illuminated. The puzzles themselves are very good. Here are my qualms: first, there are 480 levels. As I've said numerous times before: the ideal number should be between 50 & 150. Also, the graphics are annoying. As you fire your lasers, they leave bubble trails behind. If your solution does not work, the bubble trails are still there. Supremely annoying. I have not solved many of the levels, but I did do the hardest #114, which is the first image. Let's talk about the Leaderboard. There are over 3000 people playing the game. However, the game's been out for a few months now. Yesterday only 8 people were playing it. Bottom Line: I do like Photon Lab. Definitely good for young puzzlers. Yohei Sato contacted me 2 days ago with the exciting news that there are 36 new levels of his puzzle app game Tapes. I dropped everything to solve them. I got stuck on a few levels and thought that they were impossible. But I prevailed. Such a good game! Rainbow Reef has is an easy puzzle app game to overlook. The icon for the game on the app store is a big smiling yellow fish. So it appears to be a game for little kids. I was very hesitant to even download it. Rainbow Reef is actually a point scoring puzzle app. The object is to swipe/direct the swimming sea creatures to the matching colored circles. See the green seaweed? Those are blocks - fish can't swim through them. The game ends, for example, when a red fish goes into a yellow circle. Rainbow Reef starts the game easy. After 5 or 6 levels, they start to get tough. The author is Jacqueline Hudepohl and it's nice to see puzzle app games from women. I think kids would like this. Not too long ago I reviewed a terrific puzzle app game called Stroke! Ryo Takanezawa has created some other puzzle apps so I decided to check them out. Trebene seems kind of easy but is trickier than it appears. Your objective is to score points by grouping 3 or more similar colors in a group. New tiles slide in a la 2048 and/or Threes! If the board fills up completely, game over. Here's what's interesting: if you empty the board completely, your game ends. Which means that playing perfectly will yield a low score. Practically nobody is playing Trebene, even though it's free. There are maybe 15 players on the Leaderboard. Trebene is definitely worth 20 minutes of your time. Dapeng Liu has created an interesting puzzle app game called Light Weaving. I meant to post a review of this game - months ago! But, as most of you know, there is a constant avalanche of new puzzle apps that have me a bit disorganized. The object is to get a closed loop for each colored light. This is done, at the early levels, by rotating individual pieces. Look at the second image. To get the blue light you'll have to rotate the corner piece, the pipe above it and the terminus. 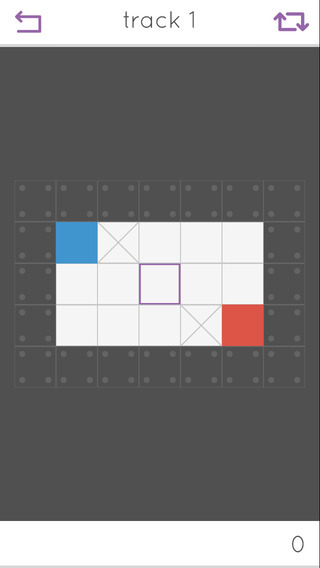 In the harder levels, tiles can swap positions. In the third image, can you can see the arrows under the purple/orange tile? Tap on that tile: the piece above it will swap with the one below it. Same effect for the tiles to the right and left of it. The third image is from a complex level because in that case, the arrow tiles themselves can swap locations. Very complicated. The 4th image shows gears - meaning that you if you rotate one, they all rotate. Think about this: what if you want just some of them to rotate, not all? The 'mirror' tile (not shown in any of these images) will reflect the image of a neighboring tile. There are 100 levels of Light Weaving. I stopped at level 73. And just for good measure, and some fun, completed all 100 in the last couple of days. Surprisingly, the last 10 are kind of easy. There's a lot of fiddling with this game. To get 3 stars - you must concentrate. We've seen this type of puzzle before - but just at the basic levels. Dapeng has really made some great innovations here. Every so often I have to spring-clean my ipad and delete old puzzle games to make room for new ones. Logisquares was a recent victim. However, before I did that, I decided to complete all 64 levels. I only needed to do 5 more. Once you get the hang of the game, they go pretty fast. But, those last ones I had to do very slowly & carefully. Read my old review. 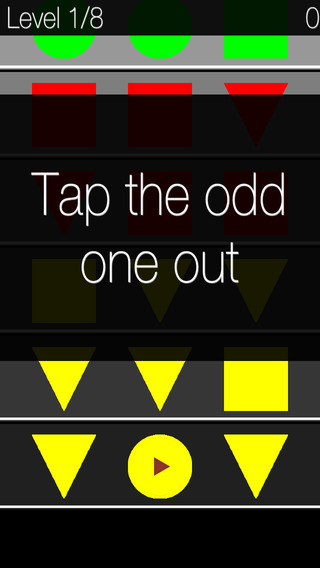 Max Glockling has created an interesting test-your-reflexes puzzle app game called Five Colors. 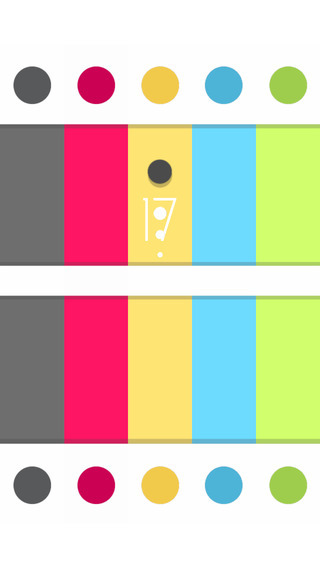 The objective is to swipe your rainbow band so that the colored ball will be captured by the matching hole. Whoa! This is hard. I think there's some good potential for this game. However, Max must allow us to start at a slower speed and gradually increase it. Click on the link below to see the video. If it doesn't work, go to his webpage. He also talks about how this game is not making any money. Note to Max: nobody is making money. I can name 15 outstanding puzzle apps that have made less than $100. Don't be discouraged: keep making games with no expectation of instant (or ever) riches. Do it for yourself and your friends and for the handful of folks who follow this blog. Kelvin Peach has come up with a fun puzzle app game called Space Crystals. 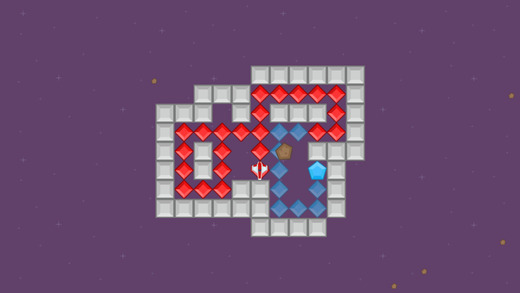 The object is to get your red plane to fly over all the red crystals. Then, fly the plane to the blue pentagon - see the first image. When that happens, the plane will turn blue and the final objective is to fly over all of the blue crystals. The harder levels have more colors and the puzzle part if figuring out the correct sequence. On some levels, your plane will have to dodge other planes and/or meteors. The puzzles are not too hard, but they're fun! There are 15 levels, and I solved them all. I wanted more! Space Crystals reminds me of another game called Blockswipe. See my review. Pushopolus is a terrific point scoring puzzle app game for the iphone, ipad. The blue arrows indicate that a pair of identical symbols can be combined/stacked. When that happens, you score points. Scoring: let's say you've got 5 hearts in a row. Only 2 symbols will combine/stack when you tap a blue arrow. The new heart stack will now say 2. The others will not move/stack. If you combine a green 2 with a green 3, obviously you'll get 5 points. There is a distinct strategy to maximize your points when you have the option of stacking up/down. The direction you choose can matter, but not always. Let's say you've got 3 blue diamonds next to each other. Left to right, their values are 1, 1, 12. If you tap left, the 1 & 1 will combine. Then the new 2 piece will combine with 12 for a total of 14 points. However, if you tap the right arrow, the 12 & 1 combine for 13 points, then the new 13 piece will combine with the other 1 for 14 points - yielding a total of 27 points. The game ends when you have no more identical pairs to match. Pushopolus has a healthy element of randomness/luck and is extremely fun. I'm very impressed. My first game: I scored only 21 points. My second game, something like 85. The next day and a half, my high score grew to 3435. I could not stop playing this game. The following day, I showed it to somebody and they pointed out to me that in the bottom right corner of the screen is the next piece! Somehow, I never noticed this, probably because my right hand simply blocked it. And I didn't read the rules thoroughly! Since you know what the next piece will be 3 out of 4 times (the 4th time is a mystery), my strategy changed significantly and I scored 45,115 in a game that took over an hour. I think I could have kept going, but it was getting late and I got careless. I hope the developers make another version of this game where you never know what the next new piece is.